Saunter on deserted beaches, whispering sweet nothings into each other’s ears, gorge on a well spread out, 6 course dinner right at the seashore. Indian Holiday’s exclusive beach honeymoon itineraries are meant for the ‘eternally in love’ sugarbirds! Lay by the sea soaking in the fresh sea breeze, sipping Mai Tais. Or maybe sign up for a snorkeling/scuba diving session and get that PADI certificate together. How about that Thai massage you always wanted. Nothing can be more romantic than spending quality time by the sea. Love is at the beach, they say! 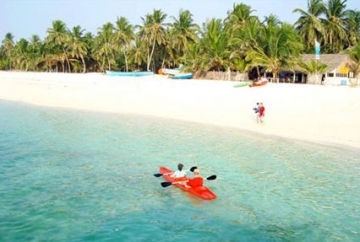 The Beach Honeymoon in India can be best enjoyed in the Indian states of Goa, Daman and Diu, Lakhswadeep and few more. These are among the best of the exotic destinations of the country featuring the best of the facilities for the honeymooners. Indulge in the luxuries of life, enjoy the lip smacking cuisines, and enjoy life in serenity, shop till you drop for the unusual and many more. Rediscover yourself on your new journey of your life! 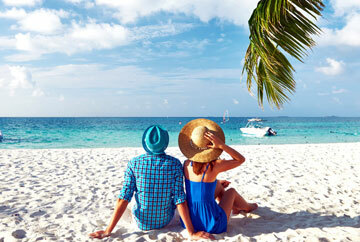 Enjoy the best of your sweet time in your Beach Honeymoon in India.